Google’s just made its “near me now” facility live on iPhones and Android smartphones, with the aim of helping you find out about services near where you’re standing. Clever stuff, but a lot of location-based App Makers will be furious. The second problem Google identified was to “make searching for popular categories of nearby places really simple.” That’s a very broad aim, so the blog post gives the example of you emerging from the subway and suddenly having a thirst for coffee: A quick near me now search will reveal coffee shops within a short range, and you can even browse on to similar services in the “browse more categories” option. It’s all available on the Google app for iPhone and Android 2.0.1 (or later) phones with a simple click, as long as you’re in the U.S.
And that all sounds very grand. But I have a problem with Google’s two problems. Is it really all that hard to do this sort of thing already? Nope. There are literally a host of apps for smartphones that do this already–the “Around me” app I use is the one that most obviously comes to mind. 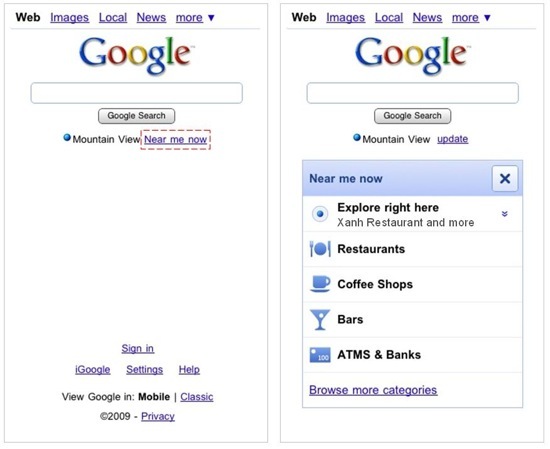 Though they may not have Google’s massive search engine running behind them, they’re nonetheless capable of delivering much of this functionality already–and in a more graphically pleasing way than Google can with its tediously bland UI. And to a certain extent, I’d probably trust restaurant reviews from inside a specialist app more than the (random? pseudo-random? questionably trustworthy?) reviews that’ll pop up inside a Google search. And this is just talking about basic location-aware apps, not far cleverer systems like restaurant finders inside the AR app Layar, or the social-network/game/review powers of Foursquare and Yelp. No, sorry Google: You’re telling us this is all to make things easier for users, but what you actually mean is you’re making it easier for mobile-net-savvy users to stay on your site while they look for location-based data, so that you can serve up adverts to them. Oh, and let’s not forget that it’s a neat way for you to get hold of location data on your users so you can profile them better for your own purposes…we’re not saying you’re evil, Google–you just sometimes make us want to wear a tin hat.